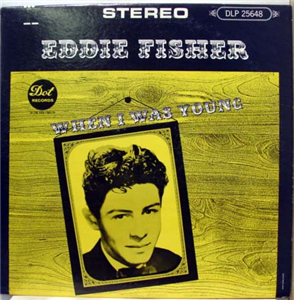 According to Wikipedia1, Eddie Fisher’s When I Was Young is a re-recording of his previous hits. Some people might think that Darth Vader is Princess Leia’s father, but I’m pretty sure Eddie Fisher was. His songs suit the big band sound. While the album was released in 1965, it was obvious right away that he didn’t fit into that decade. His songs are traditional and his voice soars, he fits more in the 1940s and 1950s. Buddy Holly and Chuck Berry should have been the final nail in his coffin. Looking at his discography, it seems that might have actually happened. The sappy sounds he produced were quickly ignored in favour of the fervour raising rock and roll he could not compete with. The record is not really my style, but it’s not bad. I could see putting this on for a party more than anything else. Fisher’s voice is strong, the man knows how to sing. Much better than Princess Leia’s other father. “Wish You Were Here” starts off the second side, and while the intro is painful, it gets into this Sinatra-esque groove that is beautiful. The strings are atrocious, but we can ignore that. Much like “Wish You Were Here,” if you ignore the intro and outro to “I’m Yours,” it’s a pretty good song. I’m trying not to laugh at “Dungaree Doll,” but it’s kind of hard not to. I want to dance to this. “Lady of Spain.” No. Just, no.